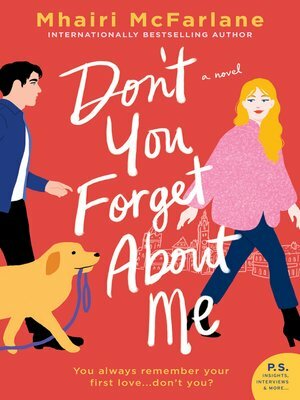 Internationally bestselling author Mhairi McFarlane delivers a funny, romantic, heartfelt novel perfect for fans of Josie Silver or Sally Thorne, and anyone who loves Bridget Jones! You always remember your first love... don't you? If there's anything worse than being fired from the worst restaurant in town, it's coming home early to find your boyfriend in bed with someone else. Reeling from the humiliation of a double dumping in one day, Georgina takes the next job that comes her way—bartender in a newly opened pub. There's only one problem: it's run by the guy she fell in love with years ago. And—make that two problems—he doesn't remember her. At all. But she has fabulous friends and her signature hot pink fur coat... what more could a girl really need? Lucas McCarthy has not only grown into a broodingly handsome man, but he's also turned into an actual grown-up, with a thriving business and a dog along the way. Crossing paths with him again throws Georgina's rocky present into sharp relief—and brings a secret from her past bubbling to the surface. Only she knows what happened twelve years ago, and why she's allowed the memories to chase her ever since. But maybe it's not too late for the truth... or a second chance with the one that got away?